McLaren revealed its MCL32 on 24 February in a launch event at its headquarters that was streamed live worldwide. The team dropped its MP4 naming scheme and introduced orange to its car, underlining the change that McLaren was undergoing. Two very difficult years were set to be forgotten with the MCL32, as Honda had promised considerable gains through the introduction of a new engine architecture, having discovered that its turbo was simply too small to recover enough energy from the exhaust gases. However, a later documentary revealed that by the time of the launch, some worries already popped up, as the team initially had trouble fitting the engine onto the chassis, before struggling to get the power unit started. In fact, the start up failed repeatedly, despite Honda software updates, until it was decided to kick start it manually. Car build was also late, with the car presented at launch not finished under the hood. One hour after the launch, the car went back to the workshop to remove the bodywork and continue the build. The team at the time only had one car available as well, contrary to its original plan to build one car for the launch, and one for testing had also gone wrong. Still, three days after the unveiling, McLaren was present at Circuit de Catalunya to start testing, only to discover numerous issues with the power unit. The first day, Alonso completed just a single lap, before the team realised an engine change was needed. On day 2, another engine change was needed, with day 3 seeing limited running once again, later also attributed to engine problems. Honda's Yusuke Hasegawa later revealed that the main issues encountered were due to the Japanese underestimating the integration issues in the car, which were pulling considerably higher G-forces due to them being wider, and using bigger tyres. 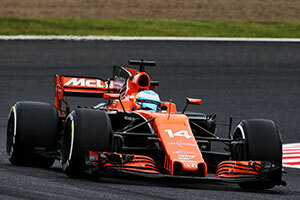 McLaren meanwhile remained adamant that its chassis was competitive, with Alonso consistently pointing towards the power unit, as of the first test. The car's unique and compact design were proved to be aerodynamically effective, as the team claimed GPS traced showed the car to be very competitive in higher speed sections, while admitting some work needed to be done to enhance performance in low speed behaviour. The troubles continued into the season, with numerous retirements and frequent grid penalties as the team had to replace various power unit components out of their allowed amount in the season. It was only at Baku when Alonso managed to score the team's first point of the season while Vandoorne only managed to do so at Hungary, nearly halfway through the season. McLaren ended its dismal 2017 campaign with 30 points, just 2 more than in their first year with engine partner Honda.